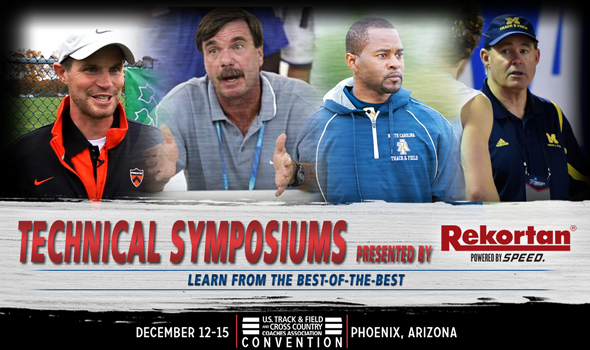 There will once again be 32 Technical Symposiums spread across four days at the USTFCCCA Convention, which this year will take place in Phoenix, Arizona, at the JW Marriott Desert Ridge Resort & Spa between Tuesday, December 12 and Friday, December 15. For those who don’t know about the Technical Symposiums or need a refresher, four disciplines will be represented – endurance, jumps, sprints/hurdles/relays and throws – and with eight coaches sharing their knowledge, that brings us to a grand total of 32. Princeton’s Jason Vigilante will be one of the featured speakers in the endurance section. Vigilante is in his fifth season as the Tigers’ head men’s cross country coach and assistant track & field coach. He also spent time at the University of Virginia and the University of Texas. Legendary coach Dan Pfaff headlines the jumps section. Pfaff is the Education Director and jumps coach at the World Athletics Center in Phoenix and he has coached nine Olympic medalists (2012 Olympic champion Greg Rutherford of Great Britain was the last) and five world record holders during his illustrious career. North Carolina A&T’s Duane Ross will discuss his strategies in the sprints/hurdles/relays section. Ross most recently tutored Christopher Belcher to a third-place finish at the 2017 NCAA Division I Outdoor Track & Field Championships and during the semifinals, Belcher clocked the sixth-fastest time in collegiate history over 100 meters (9.93). Michigan’s Jerry Clayton has developed individualized training programs for all disciplines throughout his career, but his throwers often excel the most at the national level. Clayton recently completed his third season with the Wolverines and has also coached at Auburn, Illinois, Texas State and Florida. For more information on the Technical Symposiums Presented by REKORTAN, be sure to check out the USTFCCCA Convention website.